Get alerted about emergencies and other important community news by signing up for our Emergency Alert Program. This emergency notification system enables your municipality to provide you with critical information quickly in a variety of situations, such as severe weather, unexpected road closures, missing persons, and evacuation of buildings or neighborhoods. You will receive time-sensitive messages wherever you specify, such as your home, cell, or business phone, email, text messages, hearing impaired receiving devices, and more. You pick where, you pick how. The Borough of Freehold website registration list is an "Opt-In" mailing list. The list is only used to send email notices about the Borough of Freehold website updates or other official Borough notices such as meeting notices, event notices, licensing, supplemental emergency information, etc. You will only receive e-mail notices if you choose to register and you may unsubscribe at any time using the link at the bottom of every email notice. The list and your individual information will not be sold, given, or shared with anyone unless required by Federal, State or NJ Statutes or Court directive. If you previously subscribed to receive email notices from the Borough of Freehold, you do not need to subscribe again. 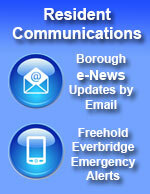 To ensure you receive the Freehold Borough e-News, please add e-news@freeholdboroughnj.gov and icpbounce.com to your address book to prevent the emails from going into your spam / junk mail folder.